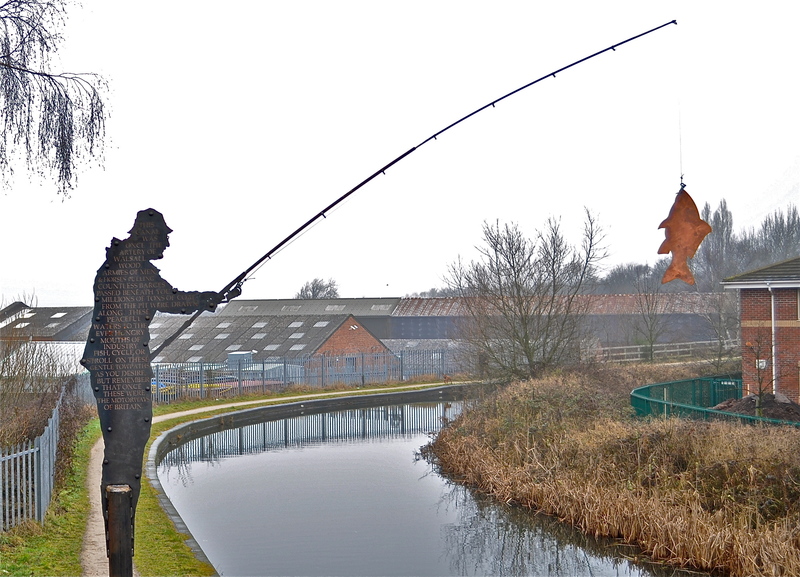 This afternoon, while passing the new fisherman sculpture erected on the canal towpath beside Walsall Wood bridge I noted that it had already been vandalised. 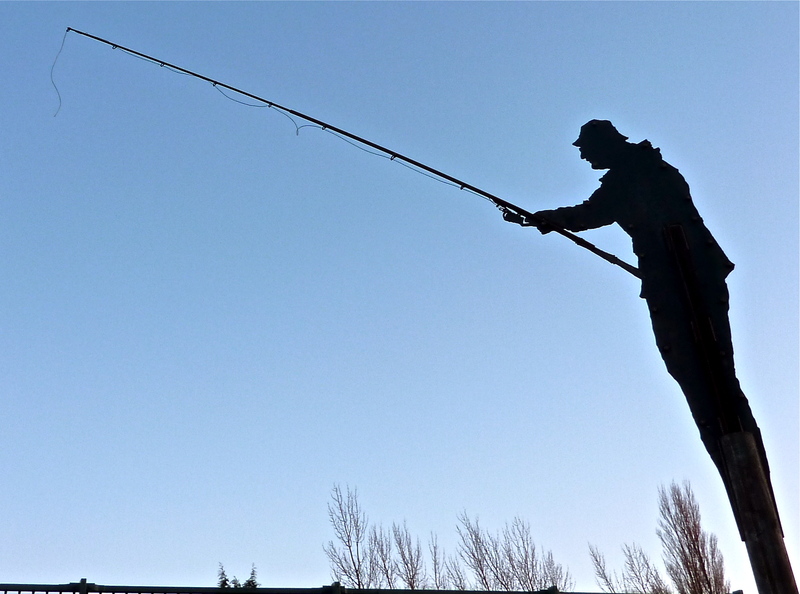 The fish that so vulnerably dangled from the end of the silhouette’s rod had been stolen. My views on vandalism in these parts are well known, and I shan’t reiterate them here, but I would just like to point out that whilst the artist, Luke Perry, may be a charismatic and talented craftsman, he clearly understands little of human nature. To hang a trophy like that fish, at a reachable and tantalising distance from a bridge parapet as it was, is just an invitation to take it. Indeed, I’d call the positioning naive. We used to televise challenges like that and call them ‘The Krypton Factor’. Needless to say, if you know of some scallywag that’s suddenly become the proud owner of a large, metallic fish without very good reason, it may be a good idea to call the local police. Let’s hope there’s a bit of a rethink before they splash out on a replacement piscine pendant…. 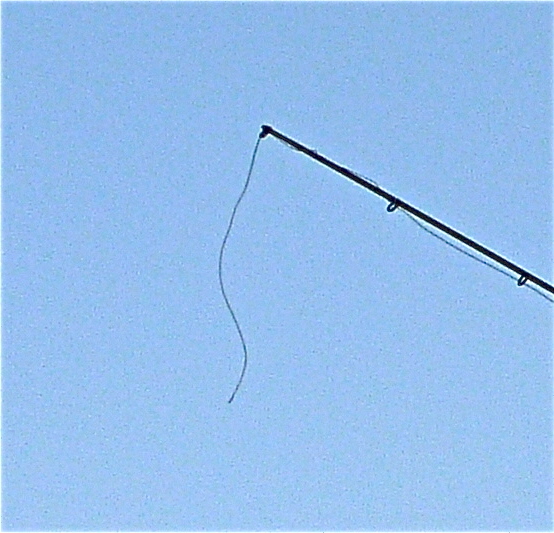 Hanging folorn, the perils of using low guage fishing twine are evident. Facade66's photo of how the artwork looked when unveiled. Note the copper coloured fish hanging from the line. This entry was posted in Environment, Events, Followups, Just plain daft, Local media, Shared media, Walsall Council, Walsall Wood stuff and tagged facade66, Fisherman sculpture, Local History, Local politics, Luke Perry, New Photos, Panoramio, Redevelopment, Silly, Vandalism, Walsall, Walsall Council, Walsall politics, Walsall Wood. Bookmark the permalink. You beat me to blogging this Bob. Get ooorf my land :-). My good lady wife & I wandered down to the event at St Johns on Saturday, and finding it too crowded, we went and looked around the sculptures. This one was the first stop, and we discussed how long it would be before the fish went, and/or the rod was snapped. The whole statue is a bit too accessible (maybe the opposite bank would have been better?) and the rod is fairly flimsy. We gave it a couple of weeks. It took much less time. I had been planning to photograph the lot before they get vandalised, but only managed this one and the Miner & Whippet due to crowds, plus it was a dull, dark day, so my photos are a bit gloomy too. Lets hope I’m not too late for the rest. Apparently the figures at Brookland Rd are painted on the back by graffiti artists, so don’t mistake that for vandalism (not a fan myself). I actually quite like all the figures. Not sure about the pithead climbing frame. Definitely not convinced this will regenerate The Wood. Tidying up the High St (the side that wasn’t resurfaced rcently) might- how far would 45K go towards it? Look. The culprit has been found. You can’t trust the Brownhills lot, coming down here, stealing our fish. With a big LOL to hapdaniel. If the fish stays put – and Luke is going to redesign the fixing to make it stronger – so much the better. Hope you like the sculptures. Best wishes to you bloggers. As long as that fish hangs where it does, it’ll be a target. It’s too close to the parapet. The fish was on the canal bank and was taken in by a resident who knows Luke and I.
Walsall Wood has had fishy goings on since 1965 when my mother was a supply teacher at the primary school.